We LOVE dark leafy greens. Especially covered in olive oil and garlic. Mmmm…. I understand why many people don’t, though. They’re often overcooked and under-seasoned, which makes them bitter and mushy. If you’re scared of dark leafies, Swiss chard is a good place to start , because it’s readily available and tastes a little like spinach. 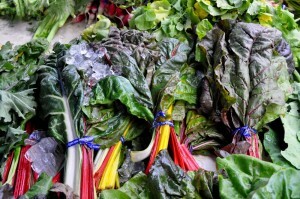 In fact, you could use Swiss chard leaves as a substitute for spinach in just about any recipe. We only have a few more weeks in NYC before the season ends, so go get some! So beautiful! How can you resist those colors??? Swiss chard is native to the Mediterranean and is a member of the chenopod (or Goosefoot!) family, which includes beets, spinach, and quinoa. Each large, dark green leaf grows on a thick stem, the color of which helps to distinguish the different varieties – white, yellow, red, rainbow (a combination of colors). It scores a 670 out of 1,000 on the ANDI scale, which is a holistic nutrition scoring system. Broccoli only gets a 376! The ancient Greeks honored it for its medicinal qualities, so you know it must be good for you. The leaves should be dark green and free of tears and large holes. Swiss chard from organic farmers will will sometimes have small holes in the leaves because insecticides weren’t used, but that’s fine. The leaves should also feel “springy”, not limp. The stems should be relatively blemish-free, but a few marks or cracks near where it was cut from the ground are okay. As a first step, follow the directions in our post here. Once it’s chopped, you can just saute it with some garlic and onions (soften the onions, garlic, and stems for about 5-7 minutes, add the greens for another 3-5 minutes, finish with a sprinkling of salt and a squeeze of lemon juice). This makes a great side or addition to pasta, soup, or pizza. If you’re feeling advanced, you could also use it as a filling for sandwiches or calzones or in a grain salad like the one below. Swiss chard is best stored unwashed, since the leaves will start to spoil quickly if they’re damp. Store it wrapped in a paper towel in a plastic bag in the refrigerator for the longest shelf life, but you’ll be lucky to get a week out of it. Swiss chard is best eaten within a few days of bringing it home. 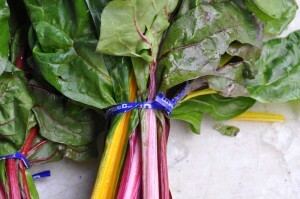 Here are two that combine Swiss chard with a sweeter vegetable to ease the “greens-o-phobia”. We like to vary this recipe from The Kitchn to use whatever we have on hand. Details to come! I think I’ll give this one a try soon, too.